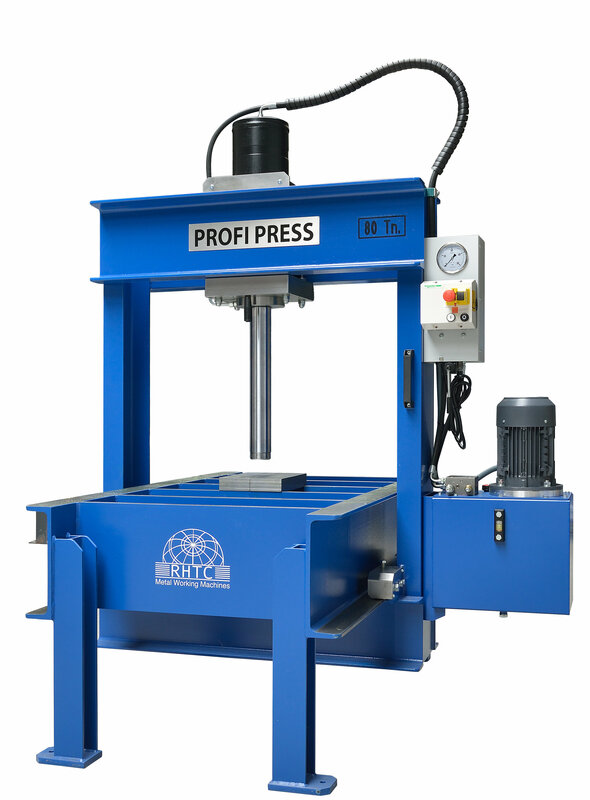 The Profi Press hydraulic portal presses are made out of ST-52.3 steel and suitable for the straightening of large sheets and heavy structures. TL-80: the movement of the headstock and the bridge can be done by hand. TL-150, TL-220 and TL-300: the movement of the headstock and the bridge is motorized. The longitudinal displacement of the frame is carried by a motor with frequency inverter and a cogged belt to ensure precise and sensitive slides. The displacement of the frame from the special models is carried by Lenze servomotors. Our hydraulic portal presses are equipped with a double acting cylinder with a chrome-plated, anti-turning piston and a removable and interchangeable hold-down plate (machined at the end to adapt tools). The cylinder stroke is easy to regulate with the stroke endings. The two-speed motorized hydraulic unit has an automatic disconnection of the high speed and contains a pressure regulator and manometer in tons. TL-80: a distributor lever located at the electric panel (this panel also contains an emergency stop). TL-150, TL-220 and TL-300: a pendant control station with emergency stop and operation confirmation button. The control panel at the right hand side of the portal press features a switch for selecting the desired type of work (manual or semi-automatic) and a switch for selecting the desired speed (fast approach speed or slower press speed). 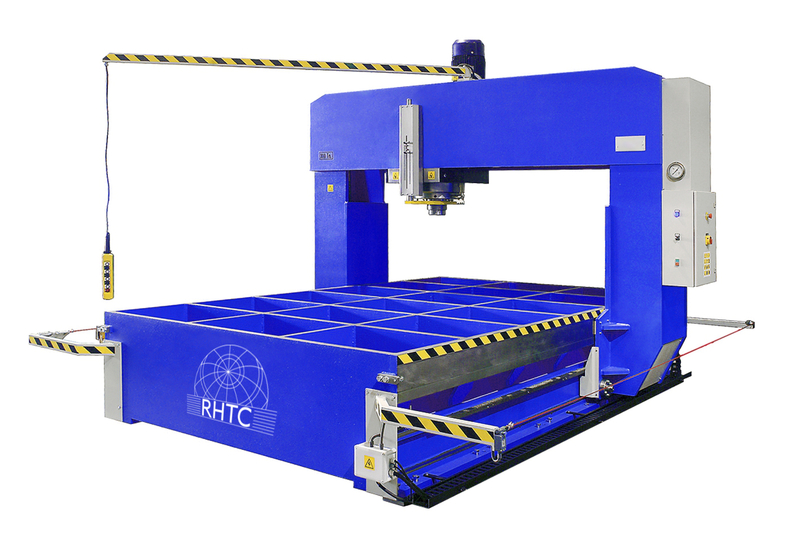 These hydraulic portal presses can be delivered with several options such as a flat lower table, ejectors installed in the lower table (connected to a second hydraulic group) or the geometry adapted to your needs. RHTC gives a warranty of two years on their presses, they are made in Europe and these Profi Press portal presses fulfil the latest CE-regulations.